Bilbao and San Sebastian (or Donostia as it's called by locals) are two locales in the Basque region of Spain that are popular with tourists. They're about 100 kilometers apart, and many travelers want to experience both the beautiful beaches of San Sebastian and the cultural attractions of Bilbao (which includes the Guggenheim Museum). If you fly to Bilbao Airport, it's easy to get a bus to San Sebastian (it will say "Donostia" on the front). It leaves regularly throughout the day. Your budget and the amount of time you have to spend in the Basque region will determine which transportation option is the best one for you. Please check the websites or call directly for current prices and timetables. There are regular buses throughout the day from Bilbao to San Sebastian. The ones run by ALSA are relatively inexpensive and the trip takes just over an hour (unless you get the slow version that makes more stops). The ones run by Pesa.net don't list their prices but they are unlikely to be that different from those run by ALSA. Pesa.net does not always have direct buses between San Sebastian and Bilbao, so be sure to check the dates you plan to travel. And be advised that Pesa.net's website can be challenging to navigate. The easiest way to book bus tickets in Spain is via Movelia. It's backed both by the Spanish government and 23 major transit operators. All trips can be booked on Movelia's website. The Basque Country has its own local train network called Euskotren. It is very cheap and there are departures every hour (more often if you don't mind changing trains), but it is very slow and meandering. It takes about 2 hours and 30 minutes (sometimes close to 3 hours) to get from Bilbao to San Sebastian on Euskotren, but if you have the time to spend, it's worth the trip. The main rail network, RENFE, doesn't run direct trains from Bilbao to San Sebastian. 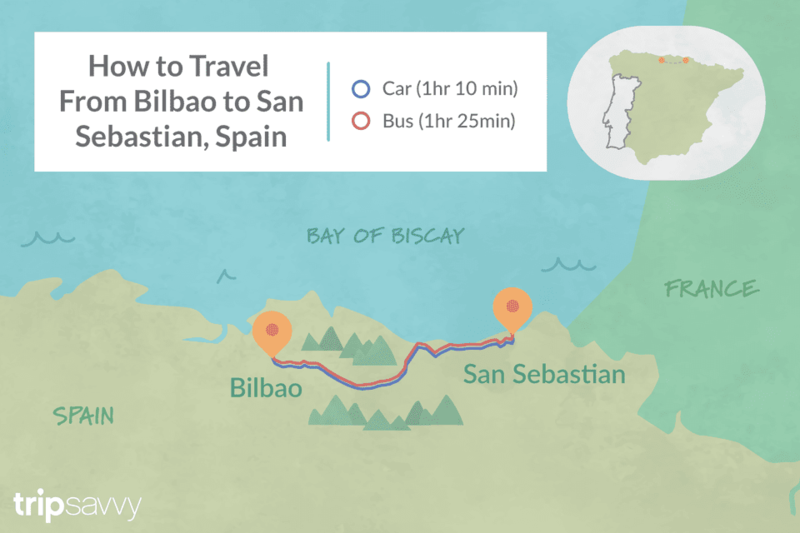 The journey from Bilbao to San Sebastian by car should take just over one hour, driving mainly on the Autovia A-8 road. Known locally as the Autovia del Cantabrico, this winding road traverses through all the coastal towns in northern Spain, including Begonte, Galicia and finally Bilbao, where it changes to the AP-8 and ends at the border with France. There are no direct flights from Bilbao to San Sebastian. Several airlines, including Iberia and British Airways, offer indirect flights between the two cities, but they're almost not worth it for the casual tourist since they can take in excess of 8 hours.